Sophie Carnell, Papers for Thoughtful Girls; with illustrative sketches of some girls lives, 2017, antique book, brass. 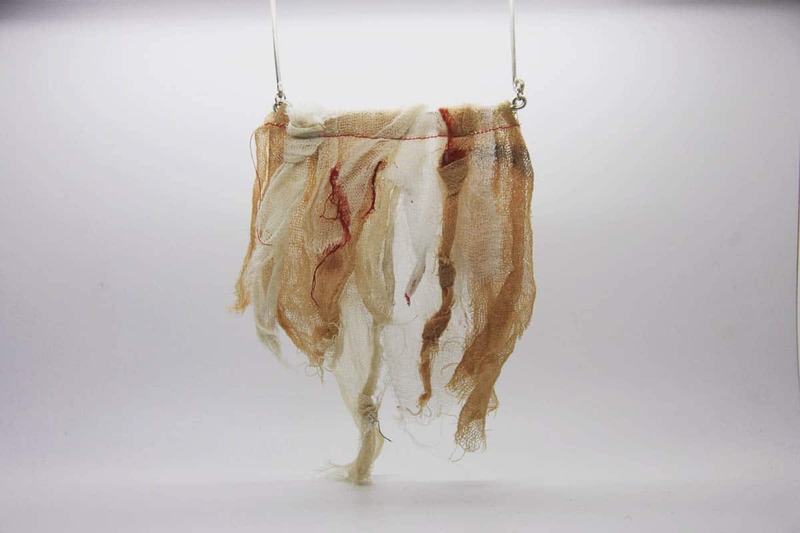 In late 2016 the Tasmanian Museum and Art Gallery (TMAG) was approached by a group of four jewellers working as an informal collective, CUSP, in Hobart; Janine Combes, Sophie Carnell, Alexandra Parish and Sarah Jones. They were developing a project exploring women’s histories buried or embedded in the museum’s collections; a project to reclaim an unwritten past. The early development of the project was revealing. All museum collections have unique histories and profiles relating to their community, its history and location and the actions of chance. They are at once artefacts in themselves as well as a type of archaeological site with strata deposited over time and influenced by events, opportunities and priorities. The initial proposal was to look at collections that had been donated to by women and to explore their lives as reflected through these. At TMAG there were really only two collections that fitted this requirement. The earliest, a bequest by Lady Dry in 1903, is a very eclectic collection of artefacts and souvenirs from her travels in Europe and the Middle East. The second is in some ways its antithesis: a very deliberately assembled and focussed collection of Netsuke donated by a Sydney collector in 2007. Location and place were central to the project and neither of these collections seemed sufficiently located in Tasmania. After some discussion, we turned, instead, to a collection that was not assembled intentionally, but had, however, embedded in it not only personal histories, but a century of histories firmly rooted here in Hobart. The Markree Collection was bequeathed to the museum in 2007. It consists, amongst other things, of the contents of the house of the donor, Henry Baldwin. The house, Markree, had been built by his parents in the 1920s and contained objects from their lives, as well as from his aunts’ and other objects inherited from preceding generations. Baldwin’s family were successful merchants in the colonial period, but the collection was characterised by many everyday, personal objects, with most dating from the generation preceding Henry’s. In a sense, the house had trapped the random residue of several generations and the collecting had been done by time and tide. The artists focussed on four women from the maternal side of Henry Baldwin’s family: his grandmother Emily, his mother Ruth and Ruth’s two sisters, Henry’s maiden aunts, Hilda and Ketha. They each researched one of the women, delving into both the museum collection and the archives to acquaint themselves with the traces left by them in documents, letters, photographs and objects. This was something of an object revivification project. Because the “function” of art works is to be looked at, they tend to be resilient in the museum and gallery context. When objects such as jewellery and personal effects pass over, as it were, into the museum they enter a realm of the undead and are denied their function, never to be worn or touched again. The artists were keen to engage with these very material traces; revivifying dead matter by incorporating into their work references overlapping their own lives with those of the four historical women. Their new objects are poised at the juncture of biographies. The four historical subjects of the project were descendants of colonial families that arrived early in the British invasion of Tasmania, then called Van Diemen’s Land. Their biographies stretch from the colonial to the modern; from the birth of Emily Maning in 1850 to the death of Ruth Baldwin in 1969. Such women rarely figure in recorded histories dominated by the actions of male politicians, churchmen, soldiers and merchants. Reconstructing their lives, achieving a concrete sense of their lived, intimate reality, is necessarily a work of imaginative empathy. 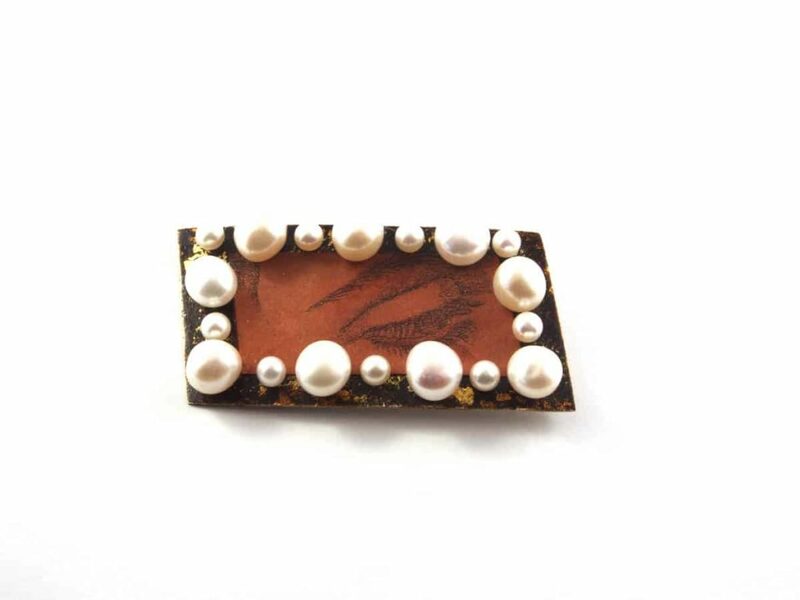 The works in the exhibition were made from traditional jewellery materials such as the metals gold, silver, brass and steel, as well as shell, enamel and pearls. The artists also used non-traditional materials and found and altered objects. 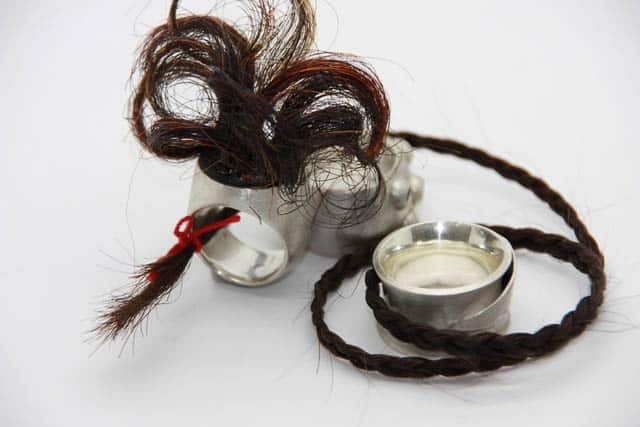 In a riff on the nineteenth-century tradition of mourning jewellery incorporating human hair, Alexandra Parish’s Three Generations rings are simple contemporary silver rings from which sprout the hair of three generations of her own family. 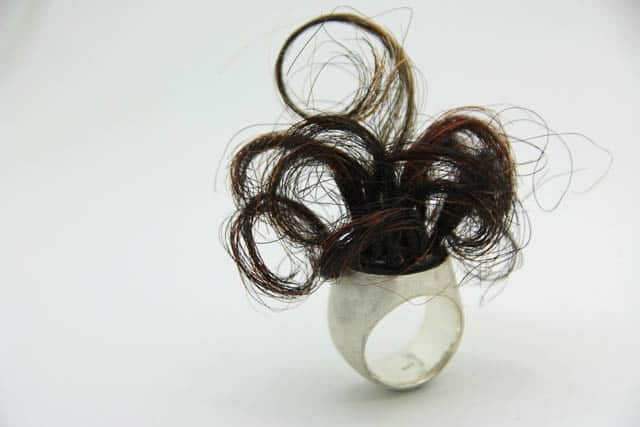 Short grey hairs project like clusters of bristles from nodes on one ring, representing her mother. The artist is represented with long hair curling chaotically from a second ring, and her daughter by a fine plait emerging from the third. 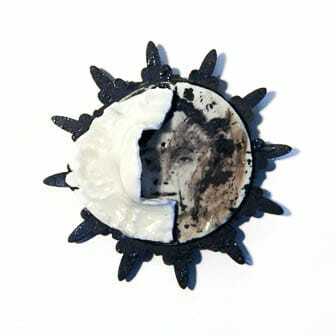 Sarah Jones’s work also plays on traditional jewellery forms and with her Traces and Memento brooches, she references one of the favourites of Victorian and Edwardian tradition, the cameo. A durable material with a timeless quality, carved cameo portraits and images often reference classical art. Eventually, however, the passage of time tells through the incremental softening and blurring of their images. Sarah made casts of originals in the Markree collection and softened and distorted them, so that they become faint ghostly shadows, mere traces of the past, all but illegible. 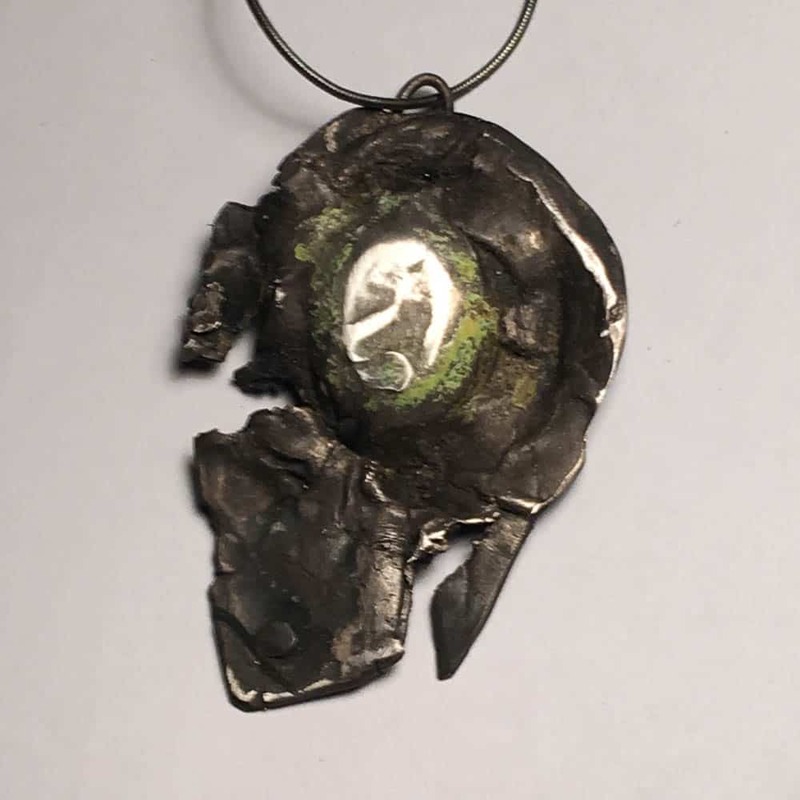 By then mounting them in enamelled steel flower-like frames with a battered, torn, stained look that suggests they’ve been retrieved from an archaeological dig or a house fire, she accentuated the enduring fragility of both memory and memento. 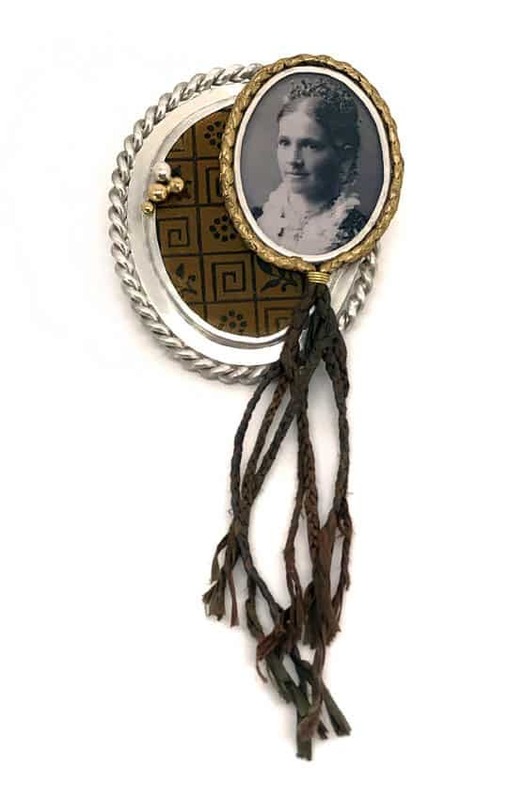 Using the traditional portrait brooch form and echoing the three ages of man, Sophie Carnell used historic photographs that represent her subject, Emily Maning, in her identities as Girl, Gentlewoman and Grandmother. 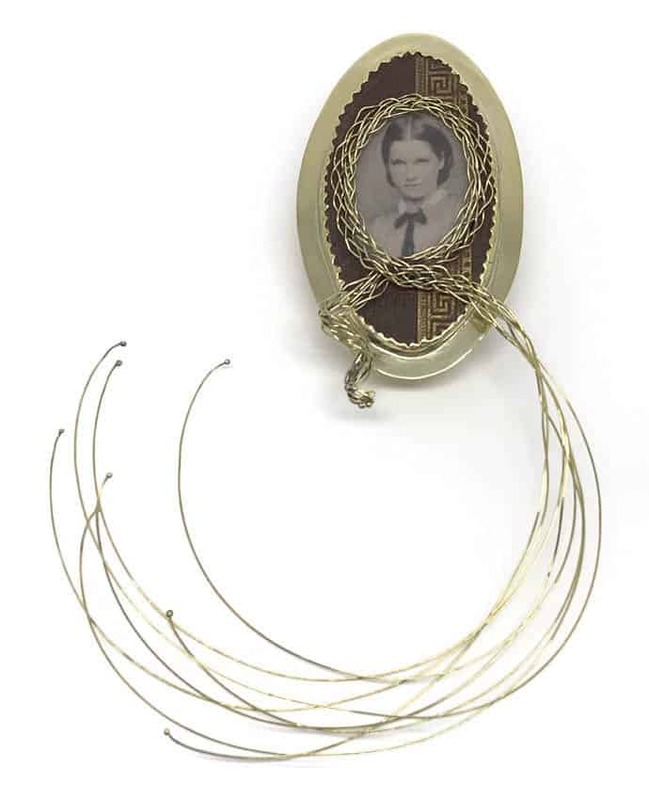 She has built around each of these portraits embodiments of Emily’s life and life stage, long lustrous gold strands for her childhood and patterned paper for her guise as homemaker, tempered with strands of human hair to represent the loss of her husband. Strings of black pearls are the attributes of her later life. Durability is a quality of the written word. We can read the same texts, sometimes from the very same books and manuscripts, as were read a hundred years ago. And yet, they are in some ways always inaccessible. They will never mean again what they meant to a reader then. 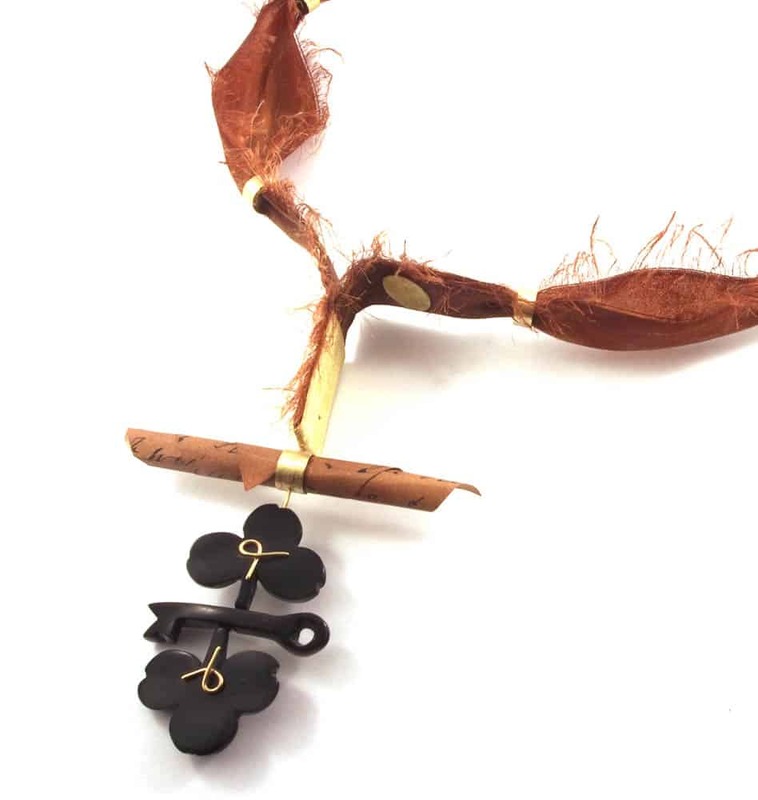 Sophie’s Papers for Thoughtful Girls neckpiece is made from the pages that have been threaded and packed together at right angles and then shaped to form a continuous, somewhat organic, neckpiece. The texture is papery, soft and fragile and the text, rendered unreadable by the piece’s construction, appears as mere flecks at the edges of the remnant pages. Hilda, the eldest of the Maning sisters, was an independent woman and Janine Combes’ work focuses on her public and private lives as postmistress and home owner. Hence the recurring themes of the letter and the key, both very personal points of contact between realms. 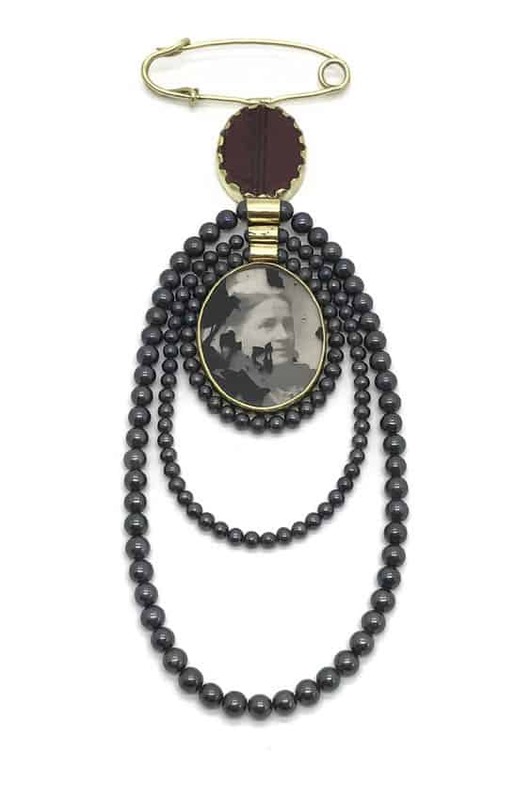 Combes’s Ancestry pendant is made up of key-like components worked from black buffalo horn suspended from a frayed red ribbon that suggests both a parsimonious landlady’s make-do convenience and the red tape of legal documents such as title deeds. 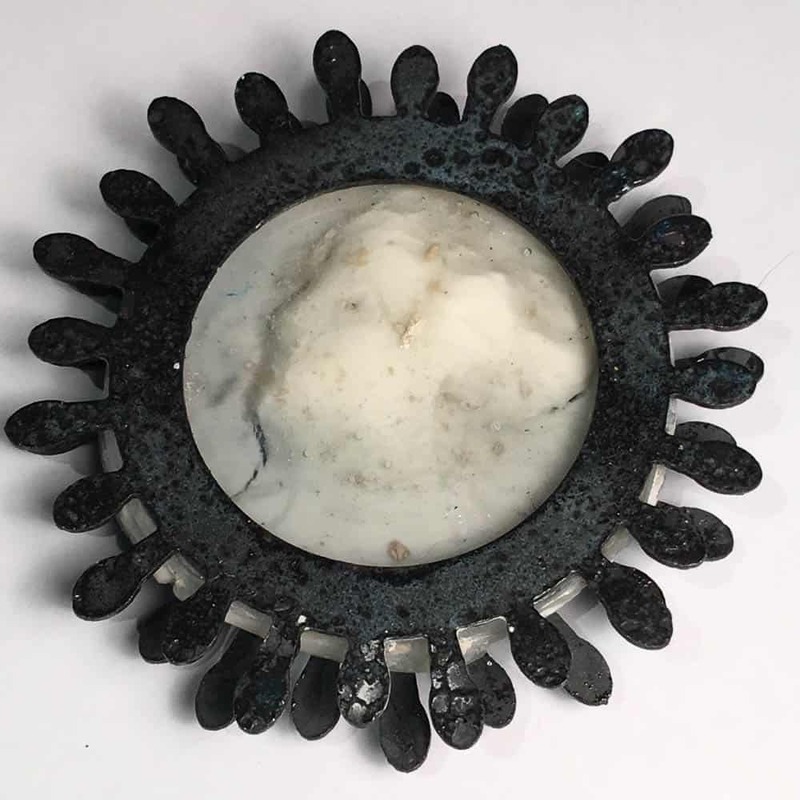 Reflecting another side of her life, Combes’s Secret Lover brooch directly references one of the historic pieces in the collection, a mourning brooch in the form of a parallelogram framed with pearls. 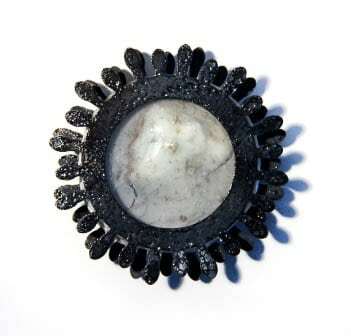 Where the original has woven hair in the centre, Combes’s brooch has an image of a woman’s eye, a fragment of a photographic portrait of Hilda, printed on red paper. She looks back at us from the past, and we try to look through the window for a glimpse of her soul, the aspirations and disappointments of her life. Ketha Maning’s life was cut short. 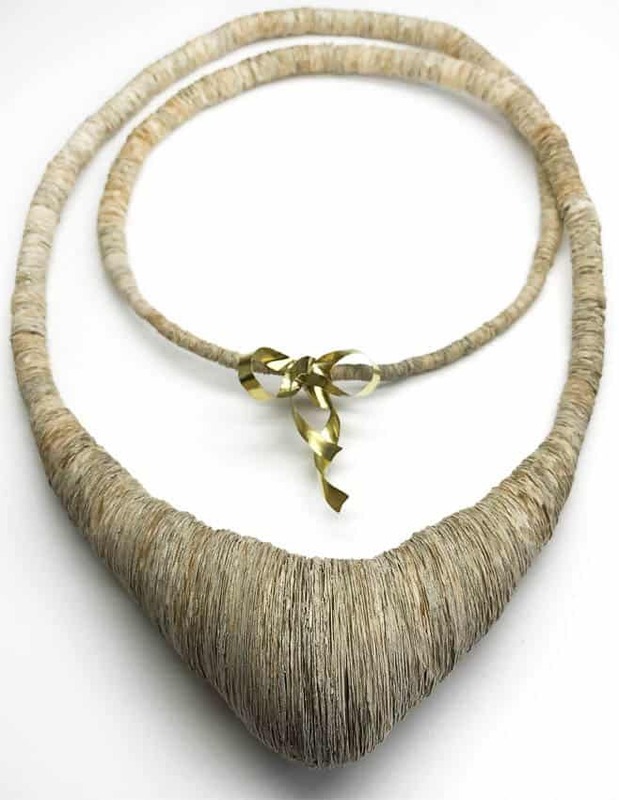 Her death at the age of 27 of tuberculosis, which she likely caught while working as a nurse, inspired Alex Parish’s TB neckpiece. 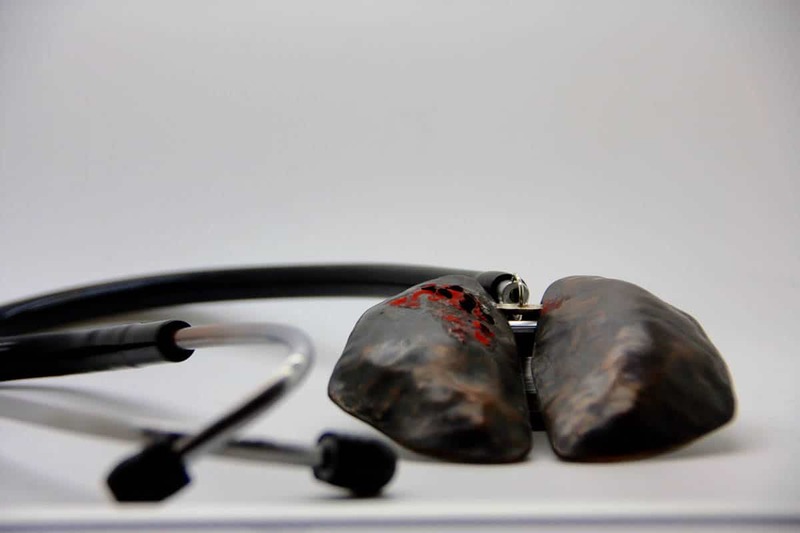 In this piece she used the listening tubes from a stethoscope—an emblem of Ketha’s profession—as the suspension for a pair of “lungs” fabricated from patinated copper with patches of corroded holes and bright red splotches referencing the once common disease’s lethal symptoms. There is a strange beauty in this grisly medical imagery that recurs in some of Parish’s other “Ketha” pieces incorporating gauze and bandages. Despite their diversity, the works in Inscription and Place share a strong undercurrent. They speak of thresholds, of liminal zones between public and private, past and present, self and other, life and death. The CUSP artist’s methodology of breathing life into museum objects through shared connections with their own lived collapses past into present. Rather than simply creating beautiful objects, though they have done that, the artists have opened a channel to a deeper appreciation of the lives of others. 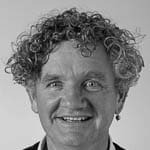 Peter Hughes is the Curator of Decorative Arts at the Tasmanian Museum and Art Gallery. He graduated with a Master’s Degree in Art Theory from the Australian National University in 1995 with a thesis exploring the links between the English nineteenth-century art critic, John Ruskin’s writing about architecture, ornament and design and ecological theory. Ornamentation remains one of Peter’s research interests along with Tasmanian colonial decorative arts, Australian decorative arts and identity, design and ecological theory, and contemporary ‘thing’ theory. Peter’s current projects include a history of Tasmanian colonial-period furniture 1804 – 1860 to be published as a book by the museum, the life and work of the Tasmanian mid-20th century potter, Violet Mace and proposed new exhibitions for the TMAG art and design galleries. Peter has curated numerous exhibitions at TMAG, including the 2012 Redevelopment Art and Design exhibitions in the Hunter Galleries and Our Changing Land; Making Tasmania in the Bond Store One Gallery. In 2015 he curated Things I Once Knew: the Art of Patrick Hall, the artist’s first retrospective and, most recently, Prospero’s Library as part of the Tempest exhibition in 2016. This is a little gem of an article, so many beautiful turns of phrase that illuminate the thought and care of the makers and of the original jewellery pieces.